Paddy Power occasionally offer money back on losing bets in certain markets if a specific team wins the game. For example if you bet on the correct score in an England game and lose your bet, but England go on to win, you'd receive a refund of up to £10 as a free bet. You can profit from this by a simple back and lay and hope for the outcome to happen. The markets valid for this offer are First Goalscorer, Anytime Goalscorer, Last Goalscorer and Correct Score. You can lock in between 50p-£3 profit (depending on the odds) by using Oddsmonkey's Trigger Bet Calculator. There are two ways at attempting this offer. You can simply back and lay the selected market and hope that your bet loses and the selected team wins. 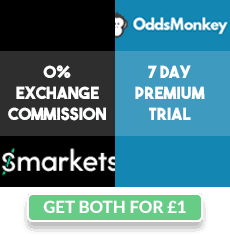 Alternatively you can use Oddsmonkey's Trigger Bet Calculator found here to lock in some profit. The profit you can lock in depends on the odds, and can vary anywhere form 50p to £3. I'll explain both methods below. Open up Paddy Power and your exchange and find a close match between the back and lay odds for either First Goalscorer, Anytime Goalscorer, Last Goalscorer, or Correct Score markets. Alternatively you can use Oddsmonkey's Oddsmatcher and filter those four markets for Paddy Power. I recommend choosing the Correct Score market and betting on a score that would make the game a draw. That way, if the team wins you're bet will definitely lose and you'll get a refund. Back £10 on your selected outcome and lay it off at the exchange. DO NOT BET ON THE SELECTED TEAM TO WIN AS YOUR BET MUST LOSE TO QUALIFY. If your bet loses, and the selected team wins you will get a £10 free bet refund. The offer won't always land but by betting on a score-draw the odds are massively in your favour. Open up Paddy Power and your exchange and find a close match between the back and lay odds for either First Goalscorer, Anytime Goalscorer, Last Goalscorer, or Correct Score markets. Open up Paddy Power and your exchange and find a close match between the back and lay odds for the Correct Score market that doesn't involve the specified team winning. For example if the game is England vs France and the refund is money back if England win, then bet on a score that is a draw or France to win. Alternatively you can use Oddsmonkey's Oddsmatcher and filter the Correct Score market for Paddy Power. For this lock in method your original bet needs to lose so it cannot be an outcome that is possible with England winning which is why you can only bet on the correct score against England. This is very important or your money is at risk. Open up Oddsmonkey's Trigger Bet Calculator. - Put your back stake, back odds, lay odds and lay commission in their respective boxes. - Put the "Free Bet Award" as £10 (as that is the reward if the offer triggers). - Put the "Free Bet Retention" as 80 (as you want 80% from your free bet). Make sure both of your bets can not happen together (e.g 2-0 to England and England to win can happen so you wouldn't place this bet. 2-1 to France and England to win can not both happen so you would place this bet). The Trigger Bet Calculator shows you your position after all outcomes which will be even no matter what. Either you'll make a profit instantly, or you'll lose a little but get a £10 free bet back. The calculator has taken into account all possible outcomes as long as you've filled it in correctly. Free bet will be expired 7 days after being credited, and is only available to use on football markets. Try to find close back and lay odds to minimise your qualifying loss, as the offer doesn't always trigger. Make sure your bet and the trigger bet can NOT both happen if you're using the lock in method in Strategy #2. If you're just backing and laying your selection like in Strategy #1 then it's fine. It's a lot easier and less time consuming to just back and lay and let it ride. If you're a hustler you should be looking to do this rather than locking in as you'll save time in the long run.